"The House of Godric Gryffindor has commanded the respect of the wizarding world for nearly ten centuries"-Minerva McGonagall. 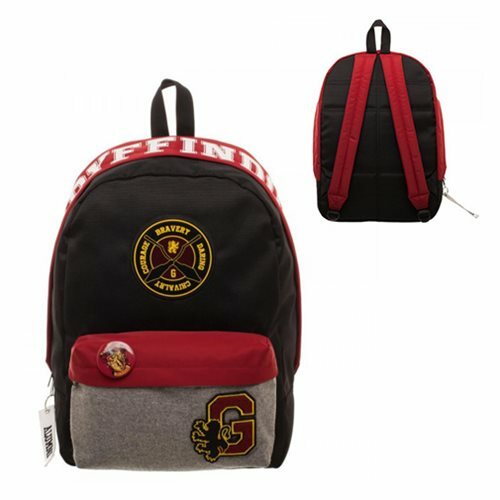 Support your favorite house of Hogwarts with this Harry Potter Gryffindor Backpack. Featuring a college inspired theme, this backpack features plenty of space for all your Harry Potter themed items! It has an internal padded laptop slide pocket, which will fit up to a 15-inch laptop. It measures approximately 17-inches tall x 12-inches wide x 5-inches deep and is made of mixed polyester. Ages 14 and up.